Located near Allentown and Emmaus, Pennsylvania, Dorney Park and Wildwater Kingdom is a theme and water park operated by Cedar Fair, L.P., offering a variety of high, mild, and family thrill rides and attractions. The site that now encompasses Dorney Park and Wildwater Kingdom was first developed as a fish hatchery in 1870 by local entrepreneur Solomon Dorney, who created a Fish Weir and Summer Resort facility to raise trout to sell to local markets. The original site featured eight trout ponds, along with a variety of picnic groves and public recreation areas. Additional attractions were added to the park in 1884, including a small zoo area and a few amusement rides, which prompted the rebranding of the facility as Dorney’s Trout Ponds and Summer Resort. Five years later, the attraction was added as a stop along the Allentown-Kutztown Traction Company’s trolley route, and two years after that, the transportation company purchased the park facility from Dorney. In 1923, Robert Plarr purchased the park from the company, managing it with two business partners until his death in 1966. Throughout the mid-20th century, the park was developed into a modern amusement park, with a number of thrill and family rides added to the park’s landscape. The park was sold to Harris Weinstein in 1985, who retained ownership of it until 1992, when it was sold to the Cedar Fair Entertainment Company. The park’s water park facility, Wildwater Kingdom, was opened in 1985. Today, Dorney Park and Wildwater Kingdom is one of the premiere amusement parks in the United States, featuring a variety of high, mild, and family thrill rides and attractions. The park is served by a number of major public transit routes and facilities, including the Lehigh Valley International Airport and the Bieber Tourways bus terminal. As a park under the Cedar Fair amusement park umbrella, owned and operated by Sandusky, Ohio’s Cedar Point, a number of the park’s attractions share features with other Cedar Fair parks, including the Fast Lane virtual queue system and the incorporation of popular licensed characters such as Charles Schulz’s Peanuts. A number of historic attractions are also preserved as part of the park, including an original fieldstone fountain constructed by Robert Plarr on the site of one of the facility’s original trout ponds. A number of thrill rides are offered at the park, including seven roller coasters. The park’s most famous attraction, Steel Force, is one of the foremost steel coasters in the world and was the first on the American East Coast to break the 200-foot barrier with its first drop. 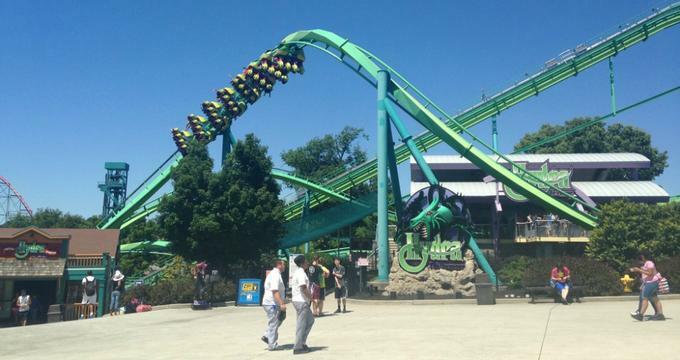 Other major adult coasters include Hydra, the only floorless coaster in the state of Pennsylvania, the dueling-tower suspended impulse coaster Possessed, and the inverted ski-lift-style coaster Talon. Classic coasters include the old-fashioned wooden coaster Thunderhawk, which was originally opened in 1923, and a Wild Mouse family coaster. A Woodstock Express children’s coaster also traverses three miniature hills as part of a family-friendly thrill experience. Other high thrill rides offered at the park include Demon Drop, which plunges riders down a 10-story freefall in an elevator-style drop ride, and the Dominator blast tower, which offers upward and downward rocketing experiences. Classic midway thrill rides include an Enterprise centrifugal force ride, a face-to-face dueling Meteor ride, and a claw-pendulum-style Revolution ride. Water rides include the Thunder Canyon river rapids ride and the Thunder Creek Mountain and White Water Landing flume rides. A large number of family midway rides are offered, including a 1921 Dentzel Antique Carousel, a 90-foot Ferris Wheel, and the Cedar Creek Cannonball old-fashioned replica steam engine. For young visitors, a Planet Snoopy children’s ride area offers Peanuts-themed rides, including the Linus Launcher, the Kite-Eating Tree, and the Peanuts 500 and Peanuts Road Rally car rides. The park’s Whitewater Kingdom offers a variety of water rides, including the high-thrill water slides Cascade, Constrictor, and the Lightning Falls slide complex. Family-friendly water rides include the Runaway River and Wildwater River lazy river rides and a football-field-sized Wave Pool with depths ranging from zero to six feet. For kids, an Island Water Works funhouse offers three levels of wet funhouse activities, while a Splash Landing lounging area and a Lollipop Lagoon offer safe play experiences. A variety of live shows are presented at the park daily, including the Cirque Imagine stunt show, the Chart Toppers live musical performance, and the family-friendly Charlie Brown’s Jungle Journey. The special Dinosaurs Alive! exhibit, which showcases over 40 animatronic dinosaurs in an exhibit integrating scientific theories and fossil artifacts, is presented periodically at the park. A number of family-friendly events are also offered throughout the park’s operating season, including a Mother’s Day Brunch event, a Great Pumpkin Fest and Halloween Haunt, and an annual Dance Festival.